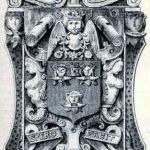 The Weavers, incorporated before 1222, belong to the oldest tradesman’s guild within the Seven Incorporated Trades of Aberdeen and were at the centre of commercial life in the burgh from those early days. With a distinctive crest featuring the weaver’s shuttle, the craft forged an identity within the trades and together with the fullers – or dyers and listers – embraced the organisation’s principles. With strict regulation from authorities on the quality and price of members’ work, the standards of the Aberdeen weavers seldom wavered and were upheld by dedicated members. Encroachments from tradesmen in neighbouring areas were frequently fought off through the promotion of the ethos which has served the Seven Incorporated Trades of Aberdeen for centuries. 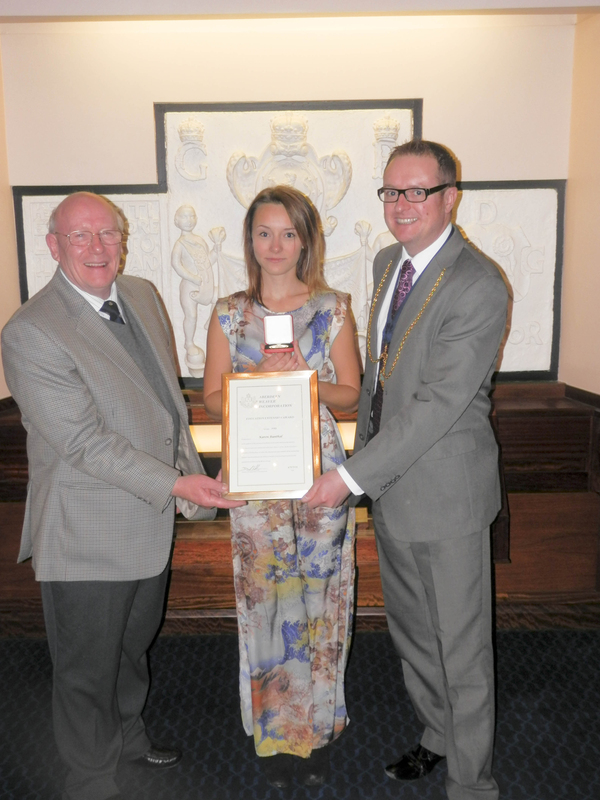 The J Kilgour medal was presented to the Trades by a former Deacon whose family business Kilgour & Walker was synonymous with the Weaving industry in Aberdeen. Kilgore and Walker started trading in the 1800s and continued through until the 1950s with sites throughout the city, the main factory being in Berryden Road, Aberdeen. The company specialised in providing items of clothing and gloves for the Fishing, Farming and Granite industry. Mr Kilgour was especially keen to promote apprenticeships in his industry and develop working skills. The Career Enhancement Award has been awarded, along with a bursary, since 1997, with the addition of the J Gray Kilgour medal in 2002. On the 5th March 2018 at a meeting of the commencement of a full council meeting at Aberdeen’s Towns House, Graeme Cheyne and Iain Hunter of the Shoemakers Incorporation and Peter Murray of the Weavers Incorporation were admitted as Burgesses of Trade. In the absence of the Deacon Convener George Esson, Ex Deacon Convener David N Parkinson proposed all for full membership. 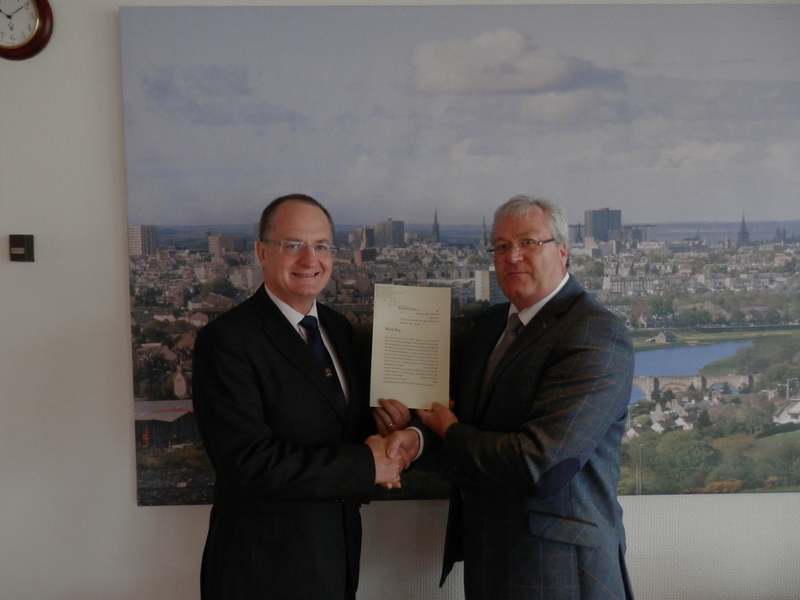 Having met the requirements laid down and paid the appropriate dues to the Lord Provost they confirmed to abide by the rules and responsibilities of a city Burgess. The following article is taken from the Robert Gordon University website and was written by Jonathon Milne, the Communications Officer. A historic North-East trade body has hosted an award presentation in honour of the talented students at Gray’s School of Art. 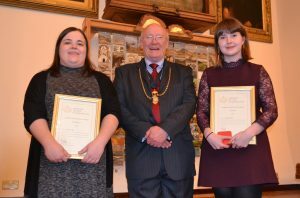 The Weaver Incorporation, one of the Seven Incorporated Trades of Aberdeen, have been presenting their annual Career Enhancement Awards at Trinity Hall since 1987. Each year, the award is given to an outstanding student on the Fashion & Textiles degree course at Gray’s and it reflects the commitment of the Weaver Incorporation towards supporting the development of skills and helping students prepare for a career in textiles. The 2016 prize was won by Kirsty Brownlee, with Laura Ukstina receiving the runners-up award, at a ceremony hosted by Deacon Ian Dale. The Weavers Incorporation, one of the seven incorporated trades of Aberdeen, announced that it will continue to present its annual Career Enhancement Award to students for at least a decade at this year’s presentation ceremony at Trinity Hall. This project, by The Grampian Guild of Weavers, Spinners and Dyers, is a celebration of the textile history of the North-East of Scotland during the last millennium. It was designed by Evelyn Duncan of the Grampian Guild of Weavers, Spinners and Dyers – an association of people who are dedicated to the preservation and improvement of their crafts. 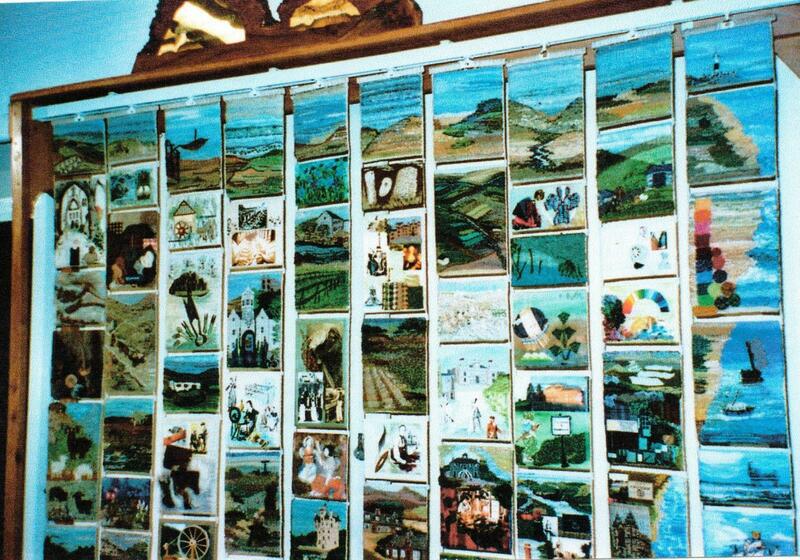 Members of the Guild interpreted and developed her design in their individual panels, illustrating the rich textile history of the region, the beautiful countryside, towns, villages and some of its people, The traditional skills of the Guild – spinning, weaving and dyeing, are represented together with knitting, felting, crochet, embroidery and lace-making. 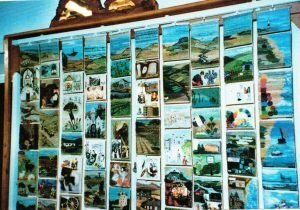 Printed and painted illustrations are used where more complex information is necessary and appropriate. The Kilgour Medal award was conceived in 1986 as a means of the Aberdeen Weaver Incorporation engaging with and providing support to the students entering Grays School of Art to study textiles at degree level, the Incorporation would invite 2nd & 3rd year students who`s work had been selected by the course leaders to apply. The Incorporation may award a monetary prize and the Kilgour Medal to the student deemed to have met the standard required for this award. A runner-up certificate and award may also be presented. Part One: A written submission to a maximum of 250 words describing the design concept and what further developments and proposed applications are being considered for the end use of the design. A brief description of how the monetary award will be used to further enhance the student`s studies through travel or the purchase of equipment or specialist yarns for the development of the student`s 4th year studies and presentation of their final year portfolio. Part Two: The written part must be supported by a portfolio of work, this work will be assessed on the level of skills achieved in sample construction and for the overall development of the portfolio and quality presented. The newest member to the Aberdeen Weavers Incorporation was admitted as a Burgess of Trade on the morning of the 13th May 2015 at a ceremony in the City Council Chambers in the Towns House. 27 Mar Kilometres or miles? Which is longer? 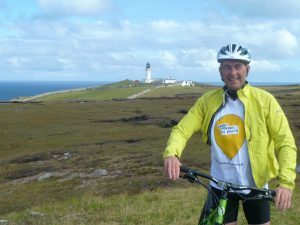 I have now completed two UK “End to End” 14 day cycles rides. 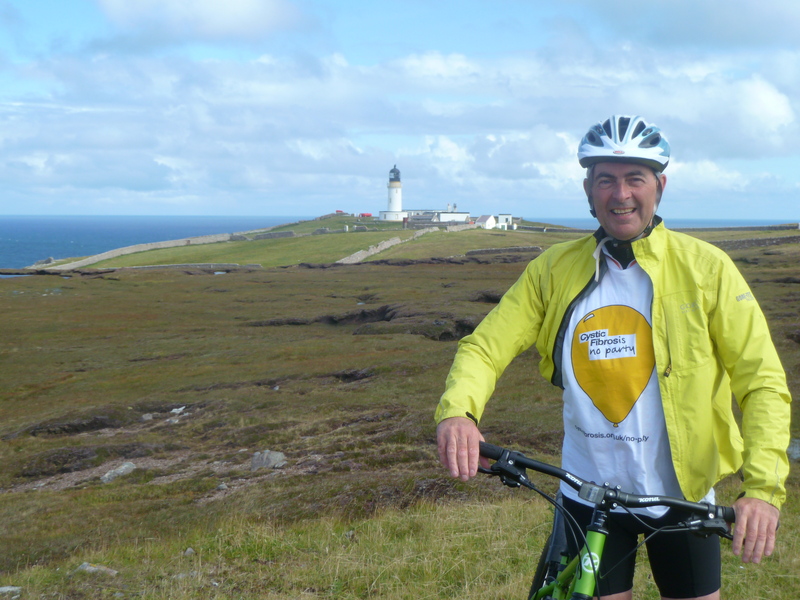 My first, in May 2013, was Lands End to John O’Groats, which for me, was a very daunting prospect as I had never tackled such a cycling challenge and this combined with the fact that I was beyond retirement age, it was a physical challenge that somewhat concerned my family. I had carefully selected Peak Tours, a cycle tour specialist from web research of the range of organisers of cycling holidays, believing that they would provide the most supportive arrangements and so enable me to achieve my objective of safely completing the trip. Such was my enjoyment of the experience that I put my name down for a place on Peak Tours’ Dover to Cape Wrath challenge, again over 14 days. This I completed in August 2014. It is said that “there is no fool like an old fool”, and my actions after completing Dover to Cape Wrath, adds considerable credence to that saying because, I have once again put my name down for another 14 day cycle ride, again organised by Peak Tours – this time it will be from the English Channel to the Mediterranean or more precisely, Caen to Nice. This will be done in May 2015. 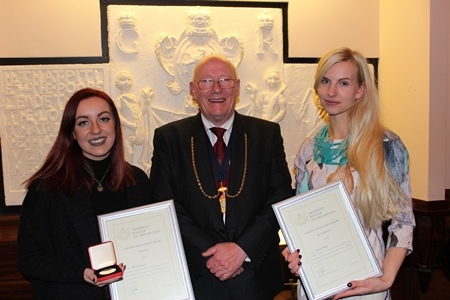 On Monday 4th November 2013 the Weaver Incorporation of Aberdeen held its annual Educational Enhancement Awards Ceremony at Trinity Hall. The Awards Scheme run with Gray’s School of Art gives recognition for the work undertaken by the outstanding students from the 2nd and 3rd Year Fashion and Textiles Degree Course following the submission of their portfolio’s to the Deacon of the Weaver Incorporation for assessment by the membership. This year’s winner of the Kilgour Medal, Certificate of Excellence and £600 was Karen Runthal with the runner’s up certificate of commendation and £300 going to Krutika Thapar. Karen’s portfolio collection was inspired by Basso and Brooke, known for using photography and still-life in the creation of prints. The Aberdeen Weaver’s Incorporation held their Annual Election of Office Bearers at Trinity Hall.